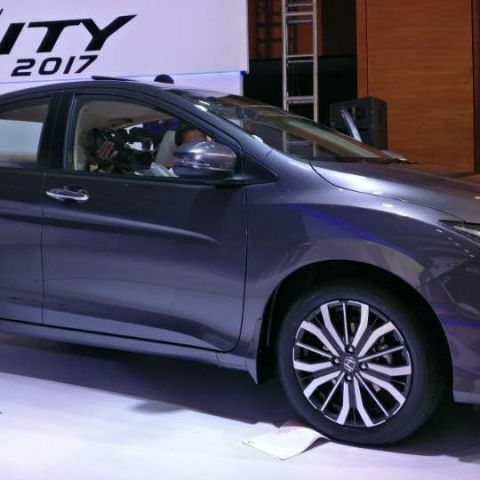 The new Honda City 2017 facelift will take on the likes of Maruti Suzuki Ciaz, Hyundai Verna and Skoda Rapid. Here's everything new it has on offer. The Honda City has been an iconic sedan in every sense, leading its segment for the most of the 19-year-old journey till date. 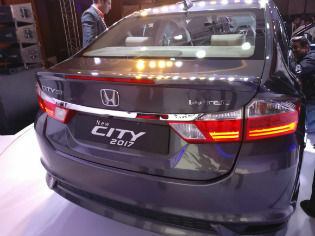 To extend its run in India and revive falling sales, Honda has officially launched the new Honda City 2017 in the country. The new edition is essentially a facelift, but brings with itself a number of new features, both outside and inside. The new touchscreen infotainment console is one of the biggest upgrades to the City. Dubbed ‘DigiPad’, the infotainment cluster is headed by a 7-inch touchscreen display. The setup will include its own satellite navigation system with preloaded maps, along with 1.5GB of storage for media (photos and video playback). The system also gets MirrorLink support, but there is no inclusion of Apple CarPlay or Android Auto in the system. The new system is built on Android, and features drag-and-drop icons for all its options, and an extensive set of operations. 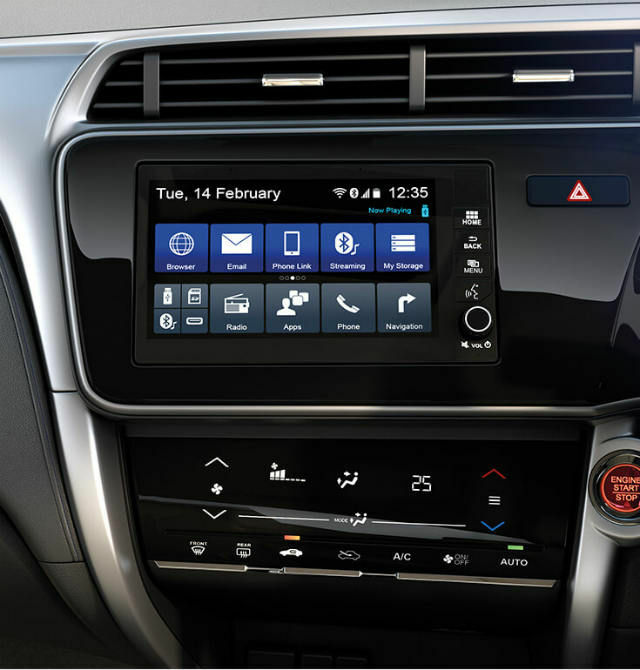 The new Honda City 2017 includes Bluetooth audio streaming and a dialer interface with access to contacts for handsfree telephony. Other key features of the console include voice recognition for Google and Siri controls, voice-controlled commands, standard music playback including two USB ports, SD card slot, 1.5GB user-accessible memory, Bluetooth and even an HDMI slot, and a receiver port for Internet connectivity for browsing, live traffic and updates. All of this combined theoretically makes up for the lack of Apple CarPlay or Android Auto, and it seems to be a neatly arranged, comprehensive ecosystem that brings all necessary features to the central infotainment unit. The audio setup includes four speakers and four tweeters, and the console provides fader, EQ and other adaptive settings for audio controls. Interestingly, there is also a section called ‘Apps’, which includes all the options and specific compatible apps on your phone, similar to Jaguar-Land Rover’s InControl suite. The Honda DigiPad also provides 3D navigation with landmark zones similar to the higher-segment Hyundai Elantra, which seems pretty neat. Alongside this largely improved infotainment console, the new Honda City 2017 includes the standard range of lock warnings, antilock braking system with electronic brakeforce distribution, six airbags, and an adaptive inside rear view mirror. You get a touch-input control panel for the air conditioning as well, which is not dual-zone. The new City also gets pollen filters in air conditioner, Push Start keyless ignition, and a ‘Smart’ trunk lock - we’re not yet sure if it would work akin Hyundai’s Smart trunk system seen in the new Elantra. 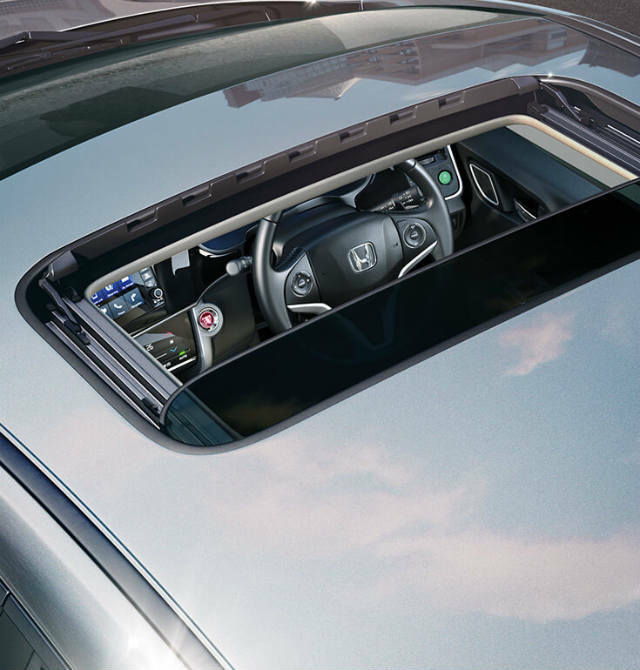 A rear camera is also included with dynamic guide rails, and the power ORVMs are auto-folding. 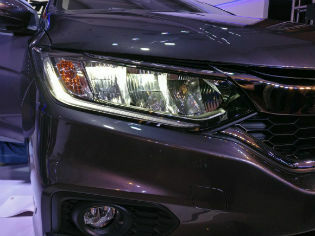 There is a lot of LED at play in the new Honda City, with new LED DRLs, ‘InLine’ LED headlamps, wraparound-style rear LED lamps, front LED fog lamps, ORVM-mounted LED indicators, and even a spoiler-mounted rear lamp as optional add-on for the top-spec ZX variant. 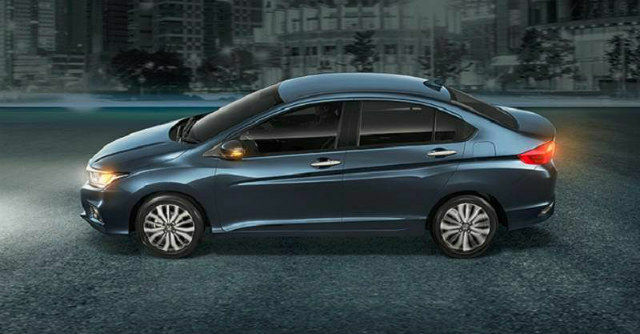 Honda has also redesign the antenna to shark fin on higher variants, and an electric sunroof with one-touch open/close finely completes the electronics included in the exterior of the new Honda City. The new Honda City 2017 uses a new transmission setup - a 7-speed CVT in AT with paddle shifters, along with automatic rain-sensing wipers and all-power windows. 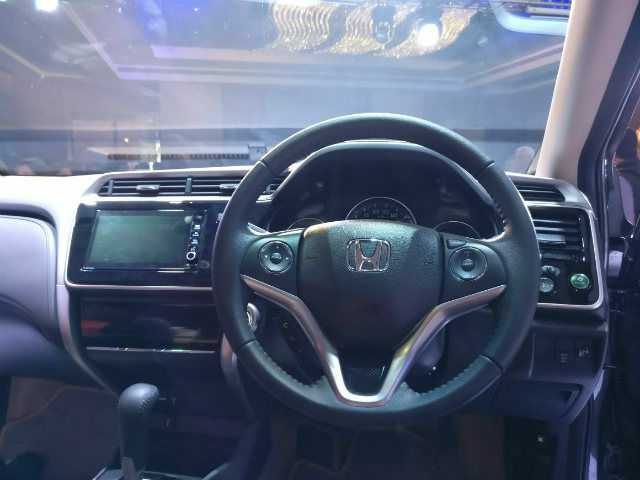 The driver seat, however, misses out on electronic adjustment, even in the top variant of the new Honda City. The instrument cluster sticks with Honda City’s signature three-ring meters, now with white LED back-illumination and chrome rails. A multi-information display, placed centrally in the instrument cluster, includes a digital fuel gauge display with reminder, two tripmeters with average fuel economy indicators, instant mileage, distance to empty, outside temperature and headlamp/key reminder warnings. Two engines power the new Honda City 2017, a 1.5-litre i-VTEC petrol engine produce 117 brake horsepower and 145Nm torque, and a 1.5-litre i-DTEC diesel engine produce 99 horses and 200Nm torque. 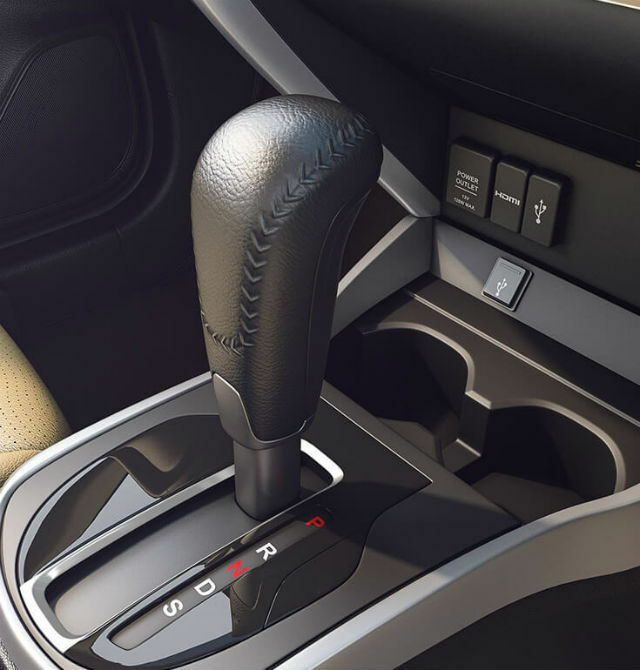 The 7-speed CVT will only be available with the petrol engine, while the diesel variant gets a 6-speed manual transmission, similar to the setup available now. 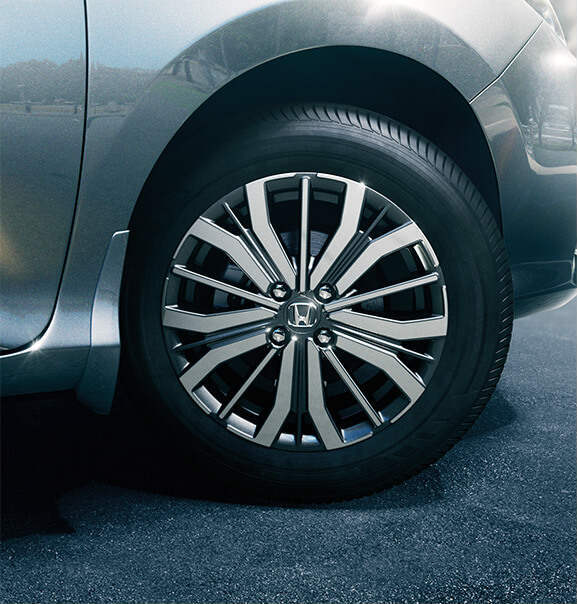 The top variants of the new Honda City 2017 employ 16-inch diamond-cut alloy wheels, while the other variants sport 15-inch wheels. The new facelift keeps the car’s dimensions same, but present a reworked front face and rear lines. The new Honda City 2017 is available in five colours - White Orchid Pearl, Carnelian Red Pearl, Modern Steel Metallic, Golden Brown Metallic and Alabaster Silver Metallic. Ex-showroom prices for the new Honda City 2017 begin at Rs. 8,49,990 and go up all the way up to Rs. 13,56,990 lac for the all-inclusive ZX variant. Pre-bookings are already on, and with the new Honda City 2017, Honda will be looking to gain back its once-steady market that has been taken over by the likes of the Hyundai Verna, Skoda Rapid and Maruti Suzuki Ciaz. It does seem to be a tad more expensive than expectations, but also carries with itself a lot of gizmos and flashes to appeal to the urban youth.